* Connection ... Bursting Boundaries! * Creation ... Alivening the unimaginable! * Contributions ... Bursting Brilliance! * Collaborations ... Catalysing a new collective power! The 'World Alive!' conference was a brilliant example of just how much the world is changing. Amazing people with incredible projects ... presenters and audience alike! The yearning to make a difference has spun into its next phase ... the emergence of collective brilliance. We are not 'stand alone visionaries' or 'one man bands' plugging away to change the world. We're a connected crew of brilliance generators creating the world anew! This event was full of inspiring initiatives, new ideas and connections to enhance what we're each up to and brilliant moments of being moved by the power of collective creation. Everyone left filled to the brim with passion, excitement, new friends and a true sense that the world is in great hands as people power continues to grow all around the planet! 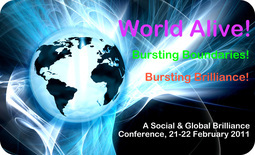 To read more about our view of Social & Global Brilliance, click on the Social Brilliance pdf article to the right. To save and/or print the conference programme, just click on the pdf Download File and it'll be all yours. * Joanna Brill (Singapore), co-creator of the Centre for Social Brilliance, source for the Visionary Network Singapore and founder of Connective Coaching.